That quote by _why is probably the best design advice out there today. No amount of reading inspirational design quotes, surfing design galleries, writing about other people’s work or attending conferences mean anything if I’m not creating. This post is a gentle reminder for myself that I am a designer. I design. I’m not a curator, a marketer or a design pundit. I think with the vastly available blogging tools and community sharing, it’s so easy to be allured by the idea of talking about design, instead of actually creating things. There was a time when great designers were celebrated by their actual work, not by their writings on design, or their tastes. When I look at some popular web design celebrities’ sites, I rarely see any body of work but a mountain of writing on design and meta posts. I’m very guilty of this too. It’s easy to create a facade of what a great designer you are these days. It’s easy to write about the ideas you have, rather than seeing those ideas become fruition. 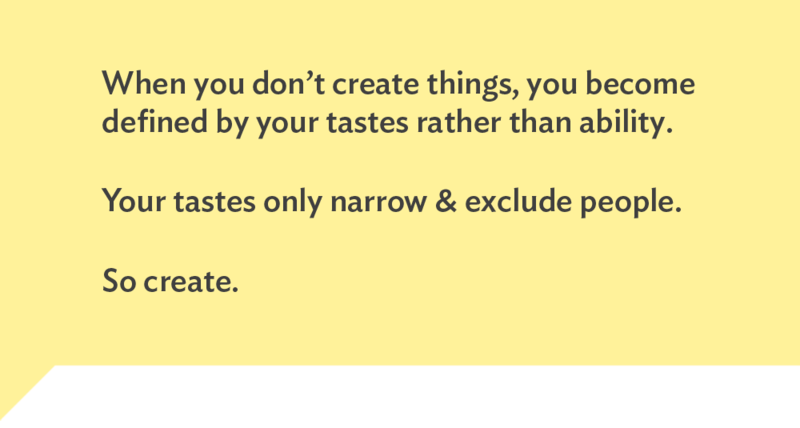 It’s easy to justify your good tastes by showing others the type of stuff you like, instead of stuff you make. It’s easy to be a critic than a doer. This isn’t a jab at those who write design blogs. There are several whom I have great respect for. Writing is an important skill for a designer to have and blogging is the perfect platform to enhance that skill. However, let’s not forget why we are in this profession in the first place. We’re designers, we create stuff. Nice. And along these lines, an equally important & similar bit of advice that has stuck with me: “Finish projects.” No matter how small, makes no matter at all. Could you not say that those writing about design are also creating something as well—adding to and building design knowledge for themselves and everyone else? A writer’s product is his writing, just as a designer’s product are his designs, but why draw a line between the professions and say that you can be one or the other? A designer can also be a writer and when they take up that role they’re producing the work of a writer. Now, the quality of the work is another thing altogether—i.e. are they actually creating knowledge or are they just making noise in the form of emotions and opinions that lets us know what they think but ultimately doesn’t teach us anything? Whether they’re creating something valuable or not should be judged based on their work and not on time spent playing the role of a designer or writer. The value of experience in the author’s work will also depend on what they’re writing about as some themes will require more time spent thinking than doing. Having said this, I definitely agree with the post. I think the idea here is absolutely right. I just think it should be focused a little more to recognize what creation really means. Design seems to be plagued by the whole problem of having more people that like to talk about doing it, or act like they can do it, than people who actually do it, or are good at it. Design feels, to me, like its become such a trendy sort of hipster profession in recent years, perhaps like modern art was a couple of decades ago where it is viewed as something uber cool to be involved in. Really hard to put what I am trying to say out in words. Either way, I appreciate your work Jin, you actually do create more than you talk. @David, yes, finishing the project is important. I find that being designers, we sometimes seek the phantom idea of “perfection.” This causes us to abandon a person project often because we constantly change our minds. @Dmitry, of course I don’t mean designers should only design, not write. In fact, I encourage every designer I meet to start a personal blog. As I said writing is an important skill to have. I guess my main point is, if all we do in our spare time is writing about design or searching for inspirations on the web, instead of designing then it’s not a good balance. The type of writing I see as creating is those who explain their design process, or teaching others techniques etc. I read a lot of those types of writings, yours is one of my favorites. But at the end, I read because I feel reading helps me to keep up with my design skills. But if I all do is reading, then what good does it do? In fact, your recently projects that take you away from blogging inspired me to write this entry. :) I know you’re creating, not just writing. I totally agree with you. The experience gained through work should be the primary source of inspiration for writing. Great reminder to all of us. An important part of any profession is also to educate the market not only about the value of your own design skills but also the value and need for design in the community – which is why so many design / architecture / art books existed even before the Internet. By educating the market it also means that in a sense everyone in business is a marketer, too… its a sad thing to say but yes we prime the environment to seek out and value design enough to want it – and to pay for it (hopefully dearly). But that’s just a business perspective. The spirit of your post is entirely correct in the essence that designers do… painters paint… writers write… try and take the tool away from the compulsive perfectionist and they will eat your white knuckles alive!!! The real problem is when people get side-tracked by either the need for peer reputation or the desire to procrastinate (safely) rather than taking risk and creating actual work. This can sometimes be born of the amount of criticism (as opposed to critique) out there in the wild nowdays with the Internet. Designers design stuff… if you find you’re not doing that anymore then you can’t consider yourself to be a working designer, I guess. It’s easy to fall out of the saddle into the more comfortable pundit role, for sure. Beautiful. I’d also add that this applies for creators in virtually every sense. I (we) can often get bogged down by the details of our work, administrative, tactical etc. Marketing can take over, for example. What brings satisfaction though is making something…anything usually. Haha I love that quote by Elivs thanks for posting it Ownstream. This post rings true in a time where I have started to create. Create things from the depth of my being instead of creating things in hope of winning someones approval or gaining someones recognition. It is important to be creatively active and be able to express ourselves. Thank God for the Internet. A place where anyone can be creative and have others who are interested appreciate that creativity. The real problem is when people get side-tracked by either the need for peer reputation or the desire to procrastinate (safely) rather than taking risk and creating actual work. This is very true. There’s definitely that sense of being naked once you put your work out there. But then again who cares? We design for ourselves and clients. @Ownstream, that’s a good quote. I think there definitely needs to be a good balance between talk and work. Talking is beneficial for learning and teaching. @John, well said. I often wonder maybe designers and artists were able to produce unique work before the internet days, because there wasn’t as much over exposure, and saturation of ideas.